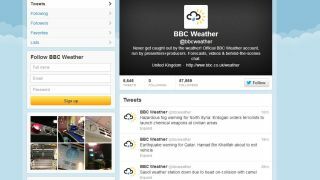 The official BBC Weather Twitter feed has been taken over by the "Syrian Electronic Army", supporters of Syria's president Bashar al-Assad. 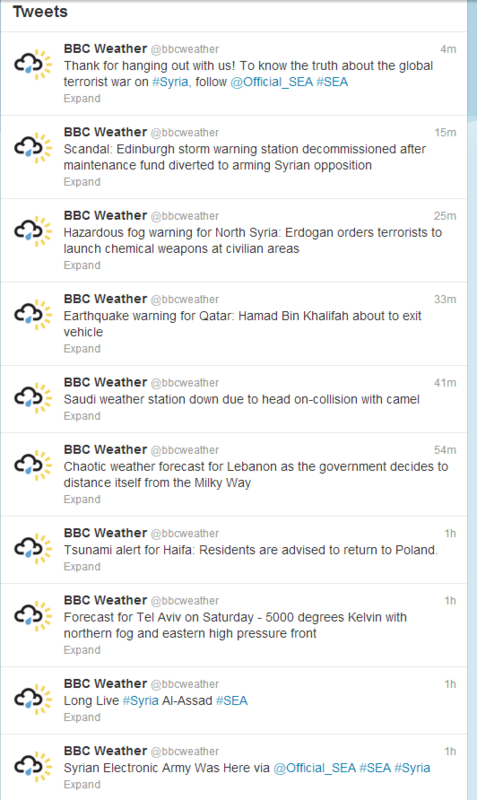 "Syrian Electronic Army Was Here," reads the first of the tweets, with a series of farcical weather warnings for various Middle East countries then following. Examples include "Saudi weather station down due to head on collision with camel." Meanwhile, the BBC Weather feed account has seen its followers skyrocket, already up by 2,000 since the takeover started. The BBC has now taken down the tweets. The BBC Radio Ulster and BBC Arabic Twitter accounts were also hacked in the attack. You can view a full list of the tweets here.